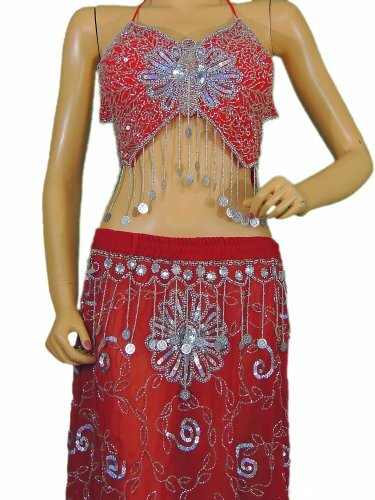 Extensively beaded and coin work Handmade belly dancing costume set in Red consisting of halter Top (Choli or Bra) and Long Skirt, from India, Size = Small. Detailed measurements in description. Dimensions: Bra / Choli: Up to Bust 34", cup size A-B, Length = 11"
Skirt Wrap: 32" waist. Length is 33". If you have any questions about this product by NovaHaat, contact us by completing and submitting the form below. If you are looking for a specif part number, please include it with your message.